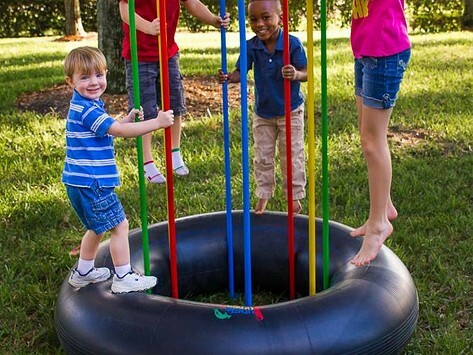 Jungle Jumparoo combines the fun of a kids’ jungle gym with the health benefits of jumping. Lower to the ground than a trampoline, it’s easy for little ones to climb on and off and has a strong frame of rust-resistant poles children can hold onto while they jump. 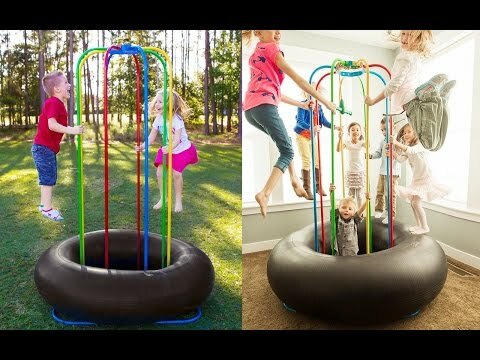 The custom high-impact inner tube lets kids have hours of active fun, indoors or out. Dimensions: 78" x 50" x 50"
Bought this to have at my house when the grandkids come to visit. It is a a lot of fun and gets rid of that extra energy. We have a small preschool and the children absolutely love it! Can't keep them off! Easy to assemble. Thanks! Just set this up indoors 3 days ago. 6 to 8 grand kids jumping on it at a time, 2 yrs old to 14. t was easy to set up. came with tools tools needed to set up. One pole was a little scratched, but the rest were great. as Grandma, I can jump about 5 mins and I am up to top aerobic heart rate. Good for building my arm mussels and I feel it in my thighs. The McMurtreys say 10 minutes of jumping has the same health benefits as 33 minutes of running. Not that kids will care. They’ll just think this kids’ jungle gym is amazing fun.